Once cold and flu season hits, it seems like we hear all about Elderberry everywhere where turn. While you may be familiar with the word, do you know where it comes from and what it can do? Don’t worry friends, I’m here to help you with all that fun information! 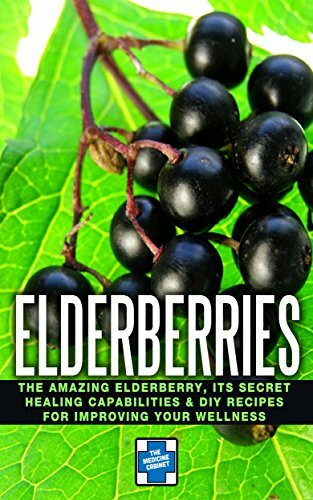 Here’s some helpful information about Elderberry just for you! Elderberry comes from a tree that is native to Europe. It is nicknamed the “Tree of Music.” A wide variety of these trees can be found in various places, but typically the Sambucus Nigra is historically what is used as a medicinal plant and to make elderberry syrup. 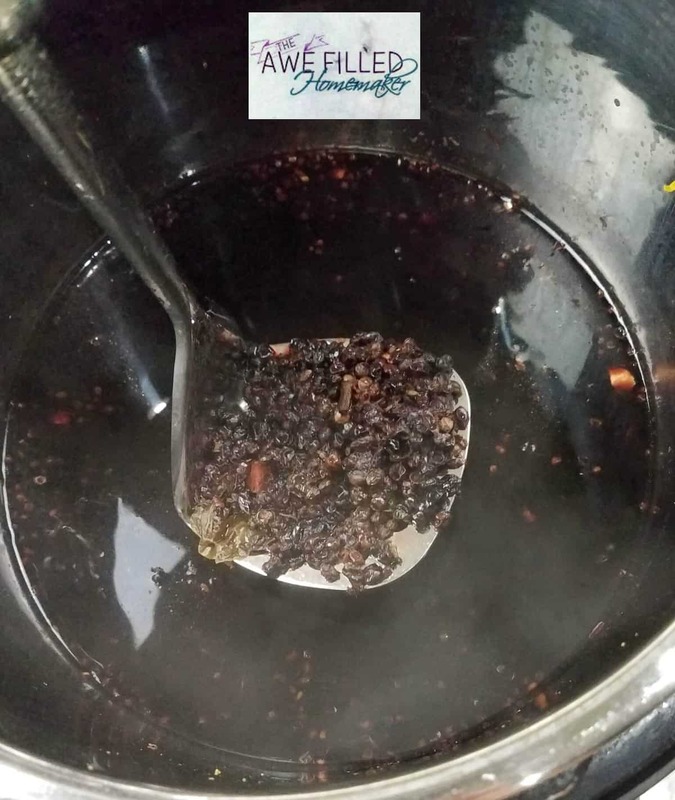 History shows that early settlers used elderberries to make a black syrup that was used to treat a variety of ailments such as fevers, influenza and to boost immune systems. 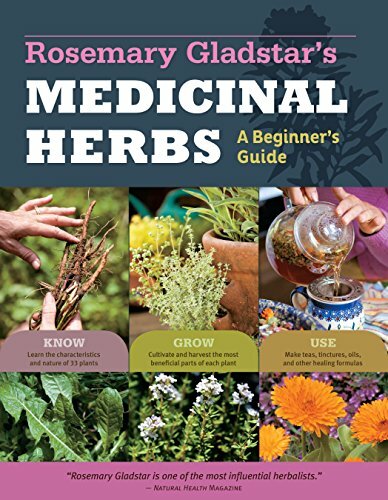 Amazon is a great place to order natural ingredients like honey, elderberries, and books! Below are the elderberries that I use for the recipe. However, elderberry isn’t a one berry show. It can also be used to help lower cholesterol, improve vision, improve heart health, a cough suppressant, treat the common cold, arthritis, skin conditions, bacterial and viral infections, and tonsillitis. Basically, this is a must have for your home medicine cabinet. For all you aspiring farmers reading this, elderberry is also used to treat livestock! Side note: Elderberry was used in Panama in 1995 to treat the flu epidemic! Once cold and flu season hits, you’ll be searching high and low to try to find it! Everyone tends to use it during the cold and sick months, and for good reason! This year, I vowed that I was going to find a way to make it myself. 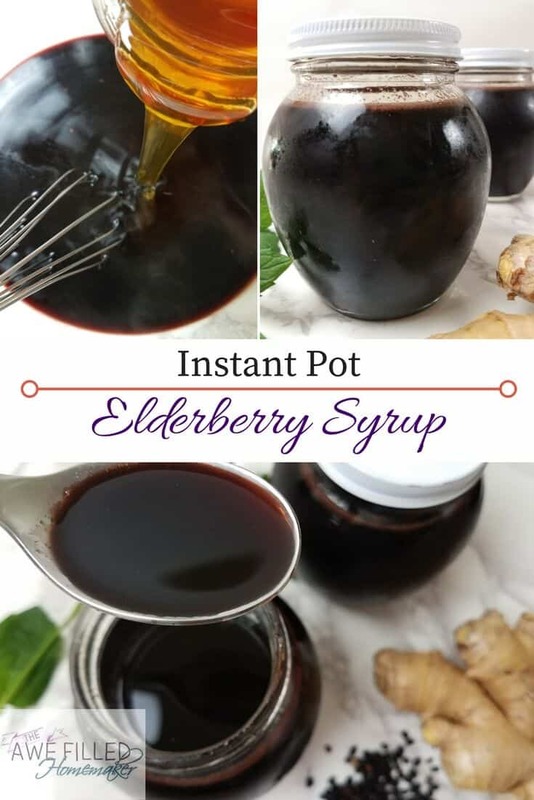 Since elderberry is a MUST have, I set out to conquer making this amazing syrup in the Instant Pot! 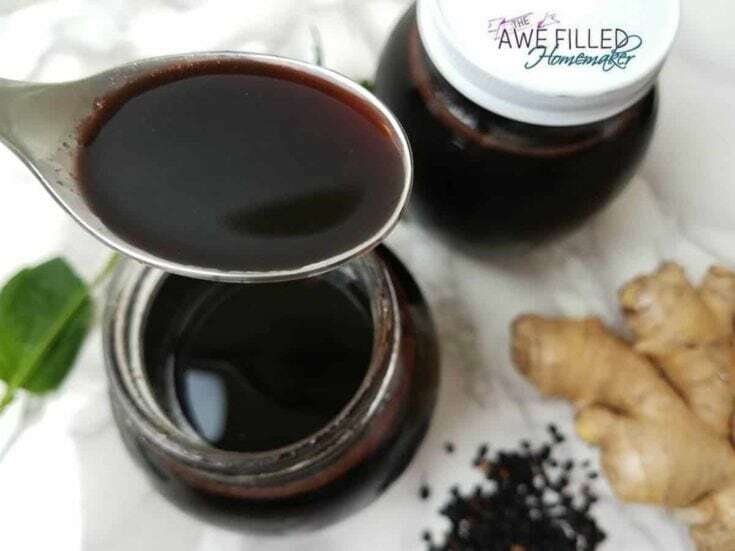 Who knew that with just a little research, time and patience it’s possible to create this Elderberry syrup right in the comfort of your own home? Let’s get to the recipe, shall we? Kids from about age 2-12: 1/2 -1 teaspoon per day during cold and flu season. IF they are sick though that changes to 1 teaspoon every 3 hours until symptoms are gone. Kids age 13-adult: 1/2-1 or 2 tablespoons a day during the cold and flu season. Then if they are sick 1 full teaspoon every 3 hours until symptoms are gone. 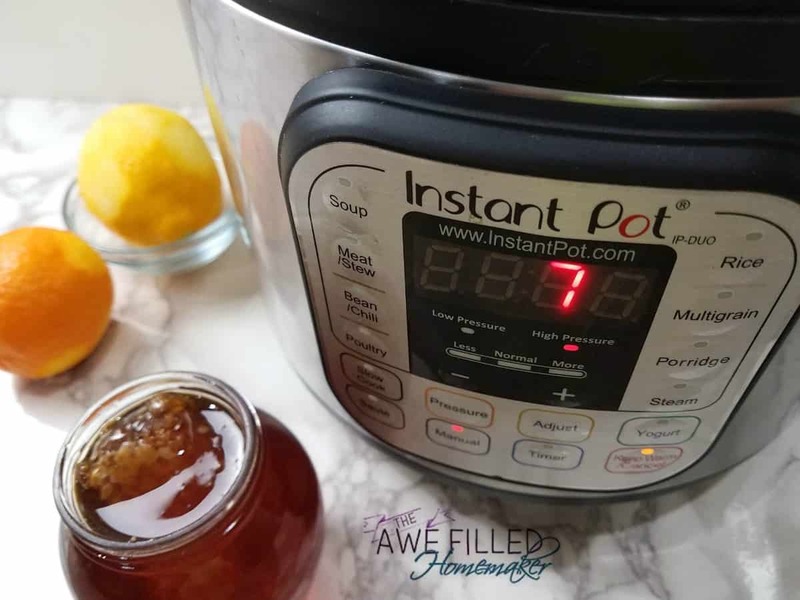 1) Combine all the ingredients except the honey in your Instant Pot. Lock the lid into place and seal the pressure valve. Using manual setting, cook the ingredients for 7 minutes on high pressure. When done, use the quick release method. 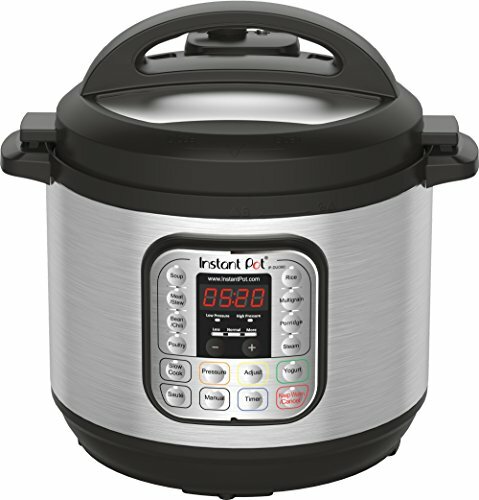 2) Remove the lid and set your Instant Pot to sauté. Let the syrup simmer in the Instant Pot for 15 minutes or until the liquid is reduced by half. 3) Mash the elderberries while still in the Instant Pot. Place a wire mesh strainer over a large bowl and strain the elderberries from the syrup. The elderberries can be discarded. 4) Let the syrup cool to about room temperature and then mix in the honey. Pour the syrup into an airtight container and store in the refrigerator. 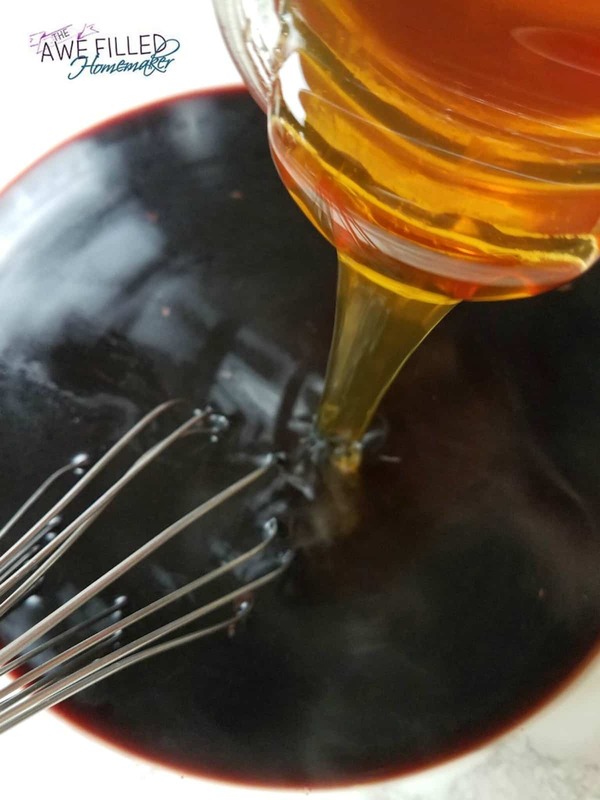 Also- I have another post on how to take this syrup and make Elderberry Gummies! And there you have it, another amazing recipe that you can make in your Instant Pot. Seriously, it just doesn’t get any more easier than that. 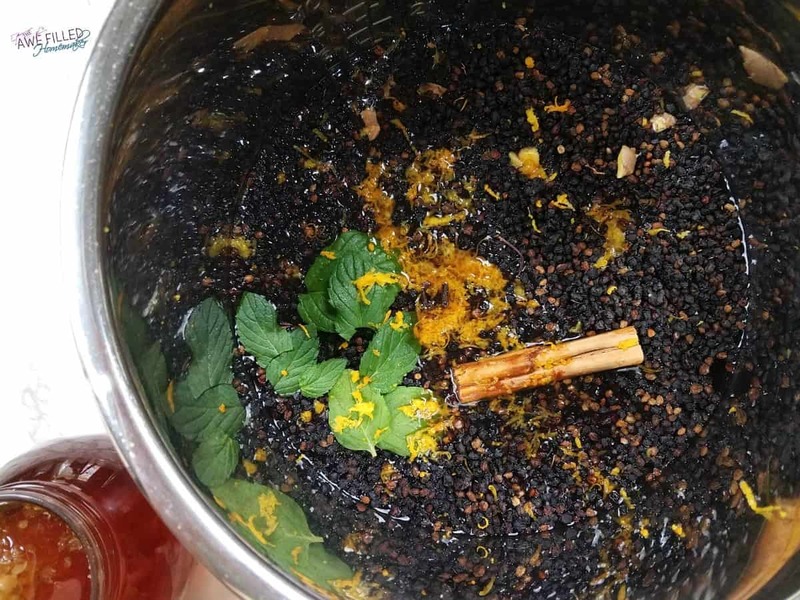 Now, you hold the keys and knowledge to make your own Elderberry Syrup this year! No more running to the store or waiting in lines to secure your bottle. All you have to do is wake up, head to the kitchen, and create! And truth be told, you’ll love the flavor of this syrup. Not only does it boost amazing health benefits, but it tastes great as well! How many times can you say that about any of the over-the-counter medicines that you buy? Give yourself a pat on the back and be proud that you’re going to make your own Instant Pot Elderberry Syrup this year. While it is simple, it’s not something that everyone can do! Take your time and share your wealth with others, so that they can see just how easy it can be to make their own syrup as well. 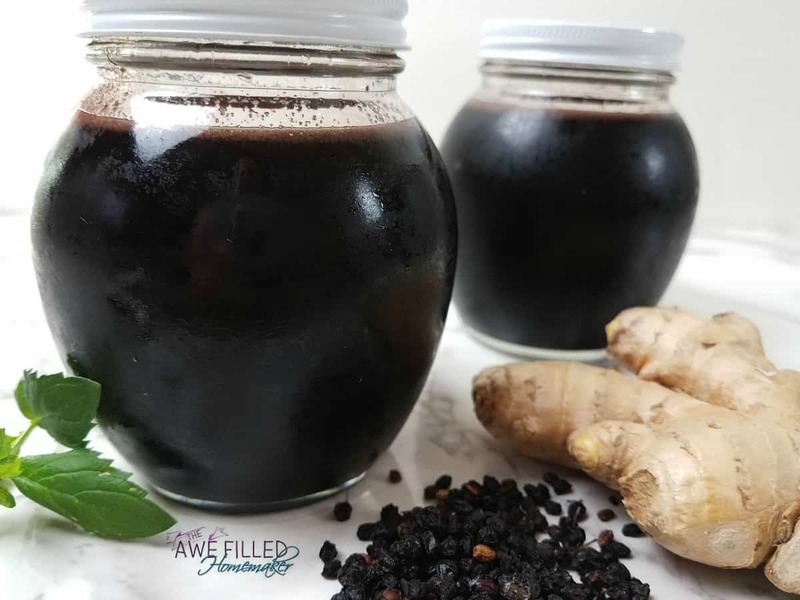 The more that you can educate them on how to create this Elderberry syrup recipe at home to benefit themselves and their family, the better! Get your printable recipe below! 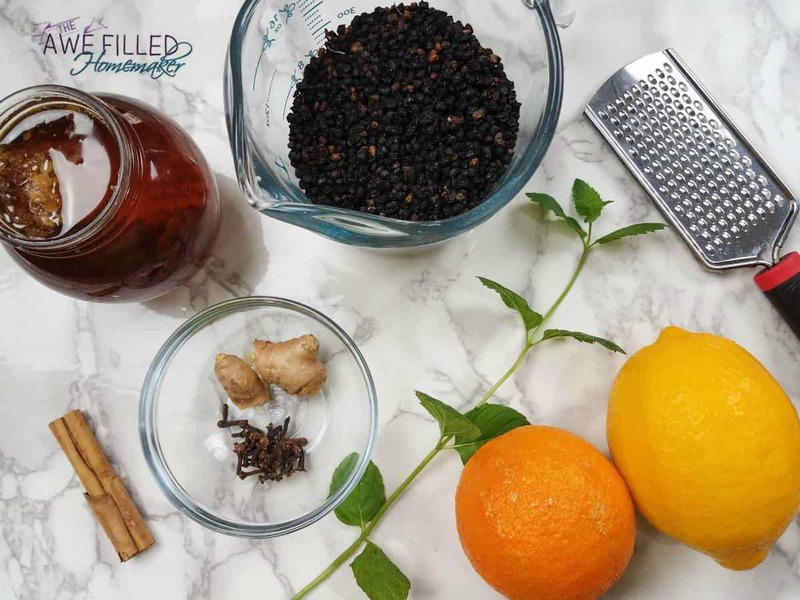 Since elderberry is a MUST have, I set out to conquer making this amazing syrup in the Instant Pot! Combine all the ingredients except the honey in your Instant Pot. Lock the lid into place and seal the pressure valve. Using manual cook the ingredients for 7 minutes on high pressure. When done use the quick release method. Remove the lid and set your Instant Pot to sauté. Let the syrup simmer in the Instant Pot for 15 minutes or until the liquid is reduced by half. 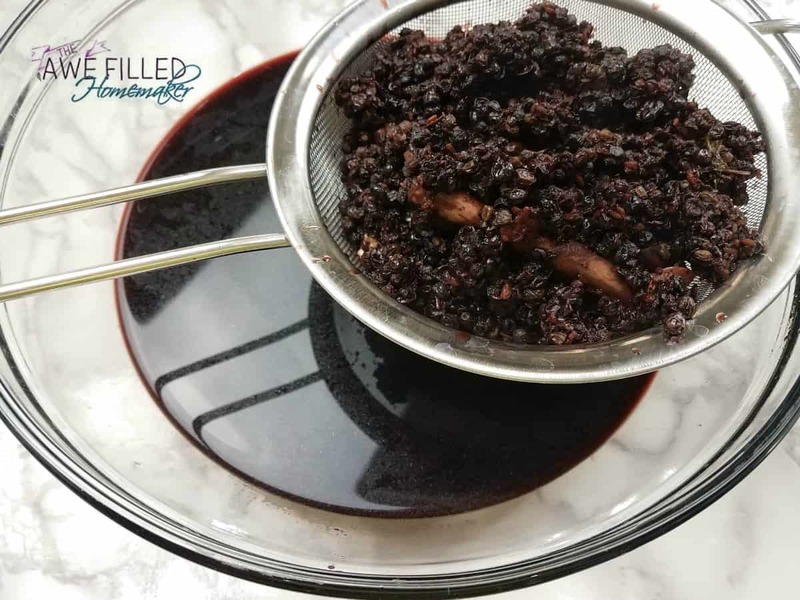 Mash the elderberries while still in the Instant Pot. Place a wire mesh strainer over a large bowl and strain the elderberries from the syrup. The elderberries can be discarded. Let the syrup cool to about room temperature and then mix in the honey. Pour the syrup into an air tight container and store in the refrigerator. Also…lets talk social media. I would LOVE LOVE LOVE it if you would follow me on my social channels and subscribe to my blog! I won’t spam you to death- I promise and you can elect to just get instant pot or recipe emails! I would love to have you follow me on my page here. Don’t forget my group too that I mentioned above! I have a few groups also. If you’re interested in the list, you can find that right here. I am on Pinterest…love love love Pinterest! You also might find me lurking around twitter sometimes and instagram! One other forgotten social media place that I am LOVING recently…google+ and lastly….you tube! Also ….I have an air fryer group too! So don’t miss that! Also, I have a lot of other Instant Pot posts including cough syrup and hard lotion if you go —>>>HERE! Thank you for sharing this recipe; it looks really good. I previously made a recipe which included lots of herbs and peppercorns, and my family wouldn’t go near it! I’m wondering why the cinnamon stick in the photo is not listed in the ingredients. I’m thinking I should add it. Is that right? Also, is the yield correct? I don’t really see enough ingredients to yield 8 cups, but I defer to your experience. Thanks again! A little over one cup. What did I do? Is it 1/2 cup elderberries or 1 1/2 cup? what is the dosage you are suppose to take? one spoon? two spoons? I see 1.5 cups and .5 cups for elderberries… may I get some clarification on how much to use please? 🙂 Thank you! Is it whole cloves or ground cloves? I have both. Can I substitute some ground cinnamon for the cinnamon stick? Don’t have that but I have tons of good cinnamon. Thanks. Thanks for sharing. Do you think this could be done in a regular cast iron type pot? Hi, the 1 tbsp cloves, I’m guessing that powdered? How long does this keep in the fridge? Thanks! Can frozen berries be used instead and does it change the amount of water added? 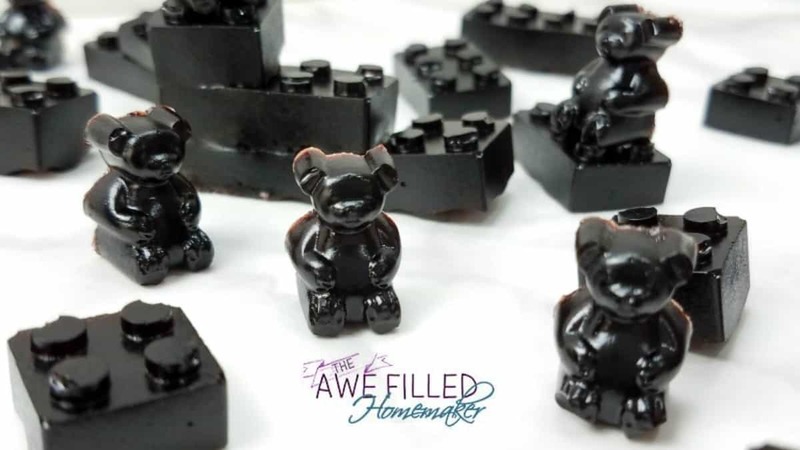 I just made a batch of this and I love it! Feels so good on my sore throat! In order to have some for another time, would it be possible to store it in the freezer? I have not froze it myself but I don’t see why you couldn’t with a freezer tight container. I adore the juice frozen, before adding the honey. 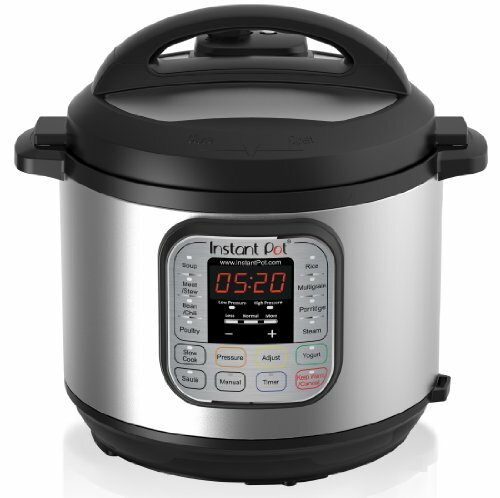 Hello, as we all know the instant pot is awesome because we can put everything in and forget about it, well that’s not always the best thing, I feel asleep after putting all my ingredients in and when I woke back up my machine had been on the keep warm cycle for a little over three hours. I took the lid off and everything seems to be fine, but I was unsure if it would effect the safety or potency of the mixture. Any advice? This was a really delicious version and love that I can do it in the instant pot. Thank you!!! What’s the dosage protocol? Thank you!!! I added more water to mine and left out the mint. It’s not real syrupy, but its amazing. We have made a couple batches of this so far! Hooray for getting rid of “the crud” that lasted for nearly a month and nothing else seemed to get rid of!! I’m just curious… once we stop using it so frequently (like when flu season is over), how long does this last in the fridge? Can you preserve it in any way? 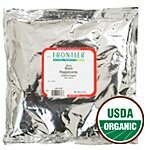 Bottling, Canning, Freezing, etc? How.much of the syrup should I take every day? 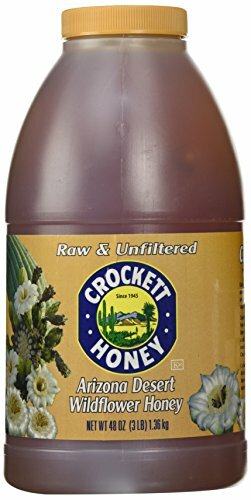 When do you add the honey? Perhaps I’m too tired from a sick kiddo and not reading it correctly. Great recipe! I swapped the honey for 1 cup of organic sugar, which I added to the pot with the rest of the ingredients and it came out great! Not overly sweet at all. I just want to drink this! Thanks!